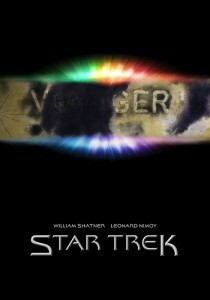 When I started this movie poster project for the first Star Trek movie (not the lens flary reboot from 2009) I had this great idea. The poster idea was wonderful, it was incredible. I patted myself on the back for t his spark of genius. I felt like Steven Seagal finding his second expression. Not long after that reality kicked in and shortened me back to the usual Hobbit size. As you can see below, the idea for this alternative movie poster for Star Trek is simple but somehow manages to boil down the whole story to the nameplate of V’Ger, the “character” the story centers on. The problem I have with the result is the scope of it because instead of a movie poster this one more feels like a cheesy book cover. Well, you can’t beat them all, and sometimes you’ll find that gap you cannot close (and now that I think about it, Star Trek plagued the same problems – amazing idea, problematic execution…this thing is cursed I say).